CAUTION: BE SURE FIREARM IS NOT LOADED DURING ADJUSTMENTS. CLEAR THE BORE OF ANY OBSTRUCTIONS BEFORE SHOOTING. ALWAYS PRACTICE SAFE FIREARM HANDLING. If your scope has adjustable parallax, focus it to the target range. Set variable-zoom to mid power. Remove the bolt, and while looking forward through the bore of the rifle, center your view on the target. This is the approximate zero for your scope. If your scope base has MOA decline, adjust the Elevation Turret DOWN the same MOA as the scope base MOA. 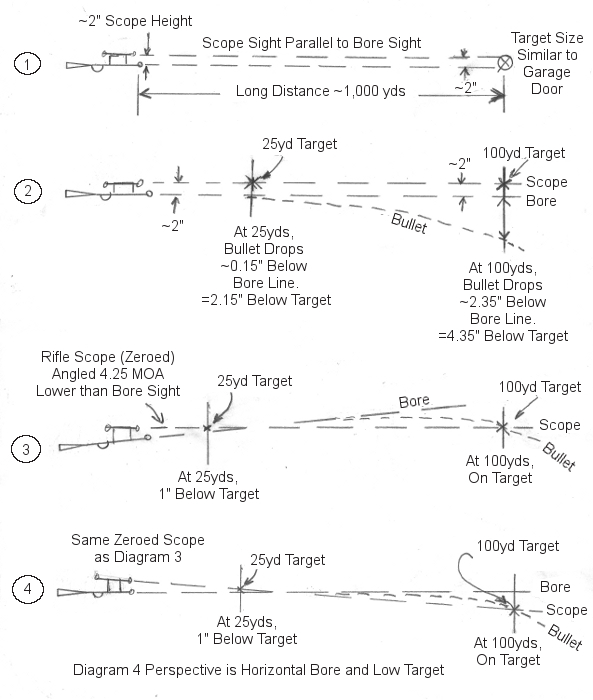 Diagram 2 shows typical 30 caliber firearm ballistics. The scope centerline is about 2″ above the barrel center. The bullet will drop about 0.15″ in 25 yards and 2.35″ in 100 yards. Get all of your exact firearm information before going to Diagram 3. (Scope Height + 100yd Drop)/1.047 = (2″ + 2.35″)/1.047 = 4.15. Because MOA adjustments are rounded to the nearest 0.25, 4.25 MOA UP is used. Your exact results will differ. The adjustment is to lower the scope angle, which requires turning the Elevation Turret in the UP direction. Sometimes this causes confusion. To make the bullet land higher, the scope must be pointed lower, which lifts the barrel higher when sighted on the target. If Diagram 3 is confusing, some people relate better to Diagram 4 which is rotated to position the barrel horizontally. The scope is sighted down through the 25yd target to the lower 100yd target. The two diagrams are basically the same. Danger: If a bore sighting instrument or any other bore obstructing device was used, remove it before test shooting. A bore obstruction can cause serious damage to the gun and possible injury to yourself and others. After making the Elevation MOA adjustment you calculated above, your scope is very close to 100yd zero. Next, test fire to remove errors from the estimates to this point. 25yd Elevation MOA Correction: (Vertical Inches from -1″) x 4. If you are ABOVE -1″ then rotate Elevation Turret DOWN. If your are BELOW -1″ then rotate Elevation Turret UP. Next, test at 100 yds. Adjust Parallax to focus on target at 100 yds. Use zoom at full power if desired, and shoot 3 rounds at the target. Measure the distance of the center of the group from the target. Adjust Turrets’ MOA 50-100% the corrective distance of the group from the target. Shoot another group of 3 shots at the target if desired and adjust Turrets’ MOA 50-100% the corrective distance of the group from the target. Last step is to adjust the Turret Covers to your zero position. Use the provided Allen wrench to remove the Turret Cover screw by turning it counter clockwise. Pull the Turret Cover straight off without rotating the Turret. Slide the Turret Cover back on with the 0 aligned with the index mark. Replace the screw firmly by turning it clockwise without moving the zero. Do not overtighten, the O-rings will protect the seal. With Tactical Turrets, note which index line is just below the Turret Cover. That is the zero position for that Turret. For Standard Turrets, count how many revolutions the Turret is above bottom. That many revolutions above bottom to the Zero index is the zero position for that Turret. Congratulations!! Your rifle scope should now be zeroed relative to your ammunition, scope mounting, target range and general firearm characteristics.